Robin led the answer and among other very valuable insights said that we must not bend on our prices. Our goal must be clarity, discovering together whether the client really wants or needs the service and if they do they’ll be willing to pay for it. If they do not, it’s not a fit for them. Robin also noted that people who argue for discounts often become difficult clients. I agreed. When it comes to professional services people value what they pay a fair price for far more than what they get at a discount. Further, when I had challenging clients (blessedly, I do not anymore) they were the ones who had fought me on price and subsequently on everything else. “Take nothing personally. These statements were made after coaching hundreds of people and experiencing firsthand that those who argue with you to reduce your pricing tend to then not value your work and argue about other things. Of course, not everyone is that way and it doesn’t mean you are. There is a coach available at every price point, some better than others, but many good. The truth is that coaches (or any other entrepreneurs) wouldn’t be able to feed their children or stay in business if they took every client and accepted discounted rates. This is not a judgment about a client’s inherent worthiness, it’s a clear understanding of what someone needs to do to successfully run their business. Imagine buying a car. Would your mind be blown if a car salesperson told a customer that they couldn’t sell them a particular car because they couldn’t afford it, or that the customer was asking for too much of a discount to work with them? NO? Then are you’re saying that coaches/service providers can sacrifice their businesses, but the car dealer shouldn’t? Many of us are like the elephant above (we all experience this at some point). 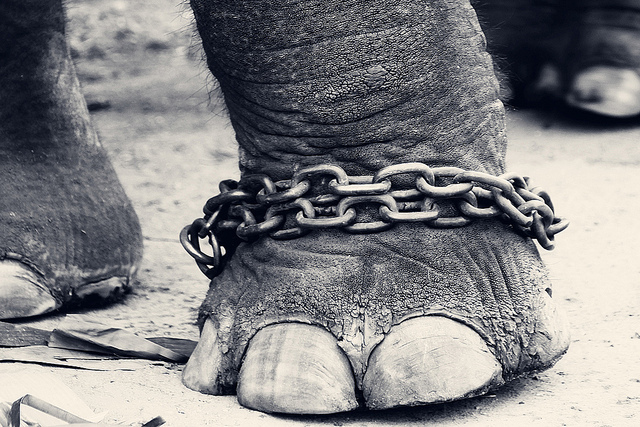 The power we have to shift our lives is restrained (chained) by our limiting beliefs. There are at least two ways to see this situation: 1) everyone should lower their rates to accommodate everyone (and deal with the negative consequences), or 2) I can improve my life by increasing the harmony and prosperity in it and have what I choose. Do you agree? Share a comment and let me know. Very true. Totally agree with you. I am struggling with this concept because I have come out of a difficult relationship and difficult finances. If it had not been for reduced rates by therapists, I don’t know that I would now be free from this relationship. I am eternally grateful that I found an organization that put me on a sliding scale for therapy. The people I coach are typically not dealing with people in crisis and most give money and time to organizations that support people in need. I am very happy that you received what you need. Love and hugs to you. Yes, we are not talking about medical care or therapy. We are talking about coaching and consulting which assumes the person has their basic well-being handled and is ready to up-level and create the life of their dreams. Tracy, You help others with your example. Love to you! That’s a great breakthrough, Tracy! Good for you! I agree with you, Cynthia. I think that people who ask for a consultant to reduce her rates does not value her as much as one who pays the price regardless. I think sometimes that people get to “friendly” and close with one another and basically ask for the “friend of the family discount” once that threshold of familiarity is reached. Other people are just penny pinching and have the “you can’t blame me for trying (to get a deal from you).” It’s cultural and familiar, and shouldn’t be taken personally. I believe that if I truly value a person’s services, I pay the price they ask. I’ve never asked my hair stylist to reduce her prices, even after going to her for five years. If my consulting prices are honestly more than you can afford, either book less time with me and spend less or find someone else who charges less. I think this is a great topic, and one we women in particular need to pay attention to — get what you’re paid for!! As a coach or a consultant whose business is helping people up-level their experience, what example are you setting, how can you effectively coach on up-leveling when you come down to the client’s level? What kind of confidence are you demonstrating in the client? Why would you pretend that the client is incapable? Why would you buy in to a story of lack? And where do you go from there? You can’t do this a coach effectively. And this is why I agree. Rates are firm. I work in a law office as a paralegal (family law for the most part) and more often than not, when a client requests a fee reduction those client’s turn out to be troublesome, their own worse enemy and typically end up subbing us out because they want to litigate their emotions while the attorney is only interested in the law. The children suffer because the parents “have no boundaries” when venting their frustrations in front of their children, they are angry over 50/50 community property, child and spousal support, etc. In short, you discount your fees, the client is unrealistic, angry, and suddenly cannot pay even your discounted fees. It’s just not worth it! Stand by your fees! Serious fees beget serious clients! Your intuition will let you know when you should step up on a pro bono basis. Kim, I hear you! I was most interested in family and property law and while in law school, I had the opportunity to spent time with lots of people with those practices. It was terrible! Whatever the outcome in a family law case, it rarely makes anyone happy. Happy would be keeping everything, retaining custody and getting support! NOT GOING TO HAPPEN 🙂 and then there are tough cases with things like abuse, adultery, theft allegations etc. Of course the lawyer is looked at as a psychologist too. Property law was less emotional in a sad way, but many people lose all appearances of grace when their money or potential profit is at stake. At the end of the deal or settlement both types of clients lamented the bill and wanted a reduction. The clients who complained about price from the beginning were, like you noted, super high maintenance and insatiable. Fantastic piece of advice, as self-employed I struggle with price reduction for sake of economy and people who want it cheap. But the bottom line is, that I need to pay my bills and put food on the table too and by clients seeking discount simply put no value on what I do, they just want it cheap! Greedy for more and pay less. Knowing how much effort, skill and love I put in what I do- reminds me to stay firm! I truly understand that times are tough for all of us, but I try to distance myself from reducing already in my opinion reasonable prices! If people truly value what I do, they will pay! If they are just window shopping,so be it! Even when it comes to those I know and friends,I remind myself to be professional not let them walk over me! This is a big issue, inner battle, to lower your own achievements to Walmart level. Big Thank You, for reminding that we have to hold our value to our own standards and not give into bargaining of cheap minds! I agree completely! I am in the service industry and my experience has been as you’ve described. Thank you for this post, Cynthia. As a life coach and entrepreneur, there are a those who have blazed the trail before me that inspire me and assist in guiding me through navigating my own way. You are at the top of that list. I find that when I look for answers, really look… they show up. Here is one such answer, so thank you. I’ve been careful not to compare myself to others regarding fees, but am also open to what works and what doesn’t for others. I established my fees and then have gone back in several times to “adjust” when clients aren’t showing up. I feel good about where my price point is at present. Where I struggle is in spending time with someone who says they want to work with me (in recent cases, acquaintances), write up a proposal and then they quickly shift to “oh, I’m not ready yet” or in other words, I don’t want to spend that kind of money. They know what my fees are prior to my meeting with them. I am working to push past this wall and am sharing as this is somewhat along the lines of potential clients wanting reduced fees. I believe in the value I offer and I know that clients will show up. Thanks again for your post and for allowing me to “brain dump” here. Again, you inspire me! So thank you for that. I have been and currently am in professions which require me to sell “my time.” I find that when I do not discount my time I set strong expectations for both the client and myself. Every now and then should I choose to charge a little less because I want to be helpful…I TELL THE CLIENT! Generally in marketing and public relations I don’t discount; and, in healthcare I don’t discount. It’s all about value … cheapest is not the best.